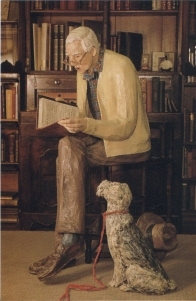 Glenn Books has been owned and managed by Frederic and Carolyn Gilhousen since 1987; however, Glenn Books has been honorably serving middle-America since 1933. Frank Glenn established the shop in Kansas City, Missouri on the Country Club Plaza. Upon his death, Ardis Glenn, his wife, carried on the business for another 25 years. We take great pride in being a part of that antiquarian bookseller history. The shop has had five locations in the last 75 years, and we are now pleased to be located at "Foxhill", our home at Lake Quivira on the west side of Kansas City. Bookshop hours are by appointment only. Glenn Books holds membership in the International League of Antiquarian Booksellers and the Antiquarian Booksellers Association of America. The bookshop is actively in pursuit of fine, important and rare books for our stock. We are always interested in examining books that you might want to sell. To keep a stock of fine books to meet our clients' tastes and requests, we travel extensively, especially in Great Britain. Our stock is chosen with discrimination and care in all disciplines; however, our focus and expertise lies in 19th and 20th century American and English literature, fine printing, illustrated books, bindings and science/medicine. - Advise and build collections for individuals and institutions. - Appraise individual books or collections for insurance, estate and charitable donation. - Consign and broker books or collections. - Exhibit at international book fairs. - Provide programs related to book collecting as time permits.